Please Register, ask for assignment solutions & post the solutions if you know any. LETS START POSTING YOUR IDEAS AND THOUGHTS AND BUILD THE COMMUNITY OF EXPERTS. Internal Sourcing is an IT Service Provider which is part of the same Organization as their Customer. An IT Service Provider may have both Internal Customers and External Customers. Internal sourcing carries a number of implications for the employer. 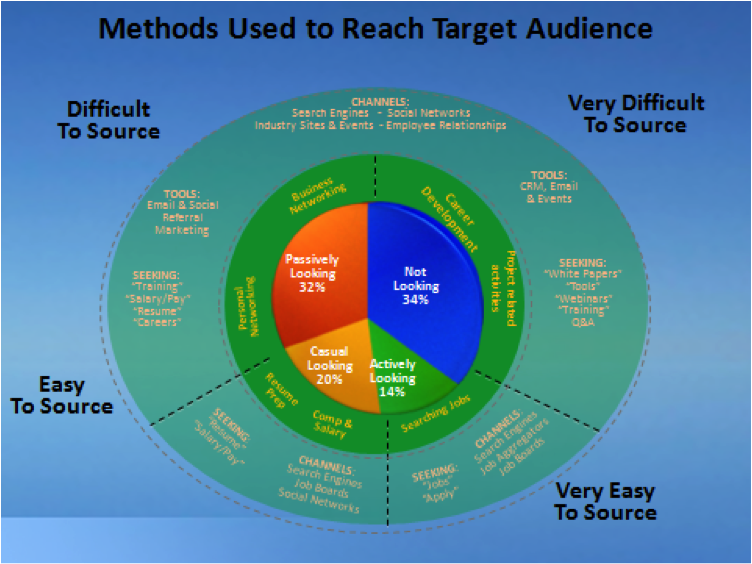 Internal sourcing can significantly reduce the costs of recruitment. Both the search process and the collection of information about potential recruits are more expensive for external applicants. The employer can more easily gain reliable information about internal candidates, and intenal sourcing can help to build a socially cohesive workforce, tightly integrated by a network of extraneous social ties. The internal sourcing of senior positions provides the employer with a powerful motivator to add to the other incentives for staff. 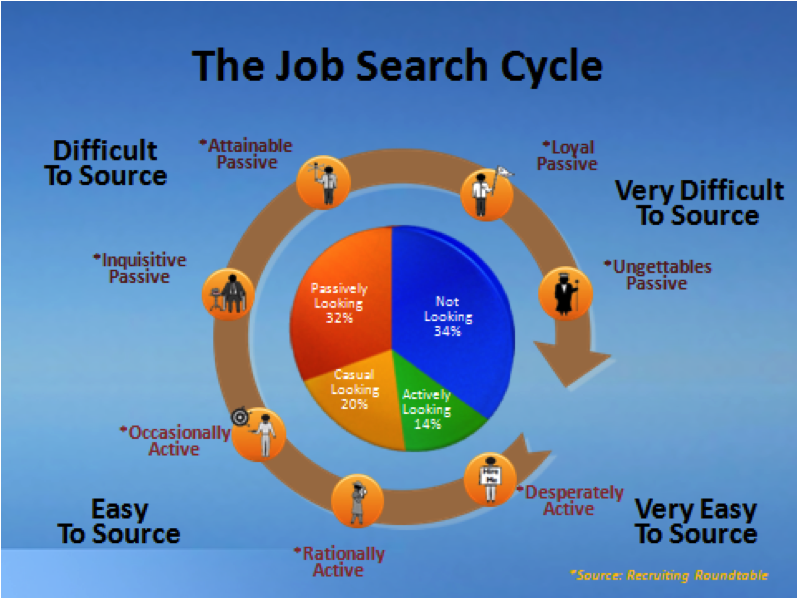 The disadvantage of internal sourcing for the employer is that, by closing access to outsiders, the organization greatly reduces the potential field of applicants. Internal sourcing provides no extensive information on the talent available in the labour market. Closing access to outsiders may actually decrease an employer's control of an organization. It may exclude talent and new ideas, and a socially integrated workforce may mobilise powerful community resources to resist managerial challenges to the status quo. Internal sourcing may increase management's dependence on existing staff. 1) discuss talent engagement model. 3) write a detailed note on retirement. about the impact of talent engagement on important business outcomes. experience, you must treat your worst prospect as your best friend. article of this series) we do not control it—our audience does. 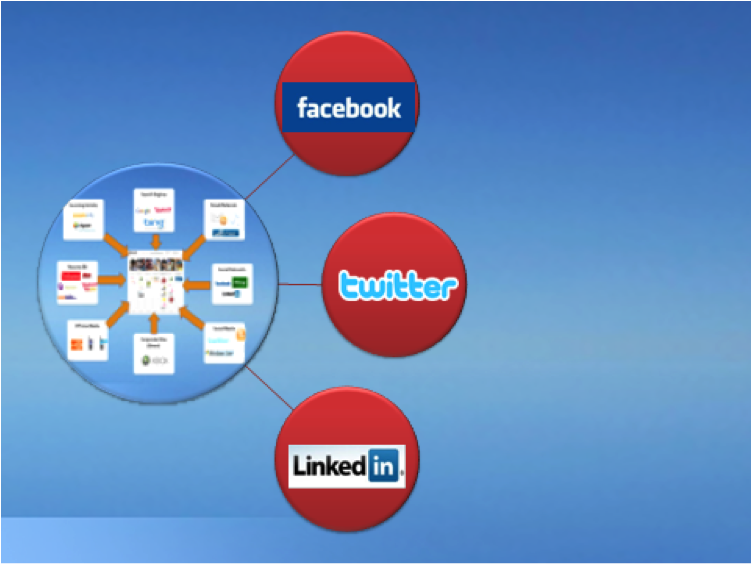 our “talent engagement model” (see figure 3) in greater detail. nature of much of our relationships we forge with prospective talent. the relationship with the prospects that we worked hard to develop. is not an “either|or” proposition, but rather a both|and opportunity. Are We Really Reaching The Passive Prospects? engaging—that is usually related to their profession, additional training, etc. Another layer to the discussion is “touch”—technology and human. as “SEO Gettables. “ But, we still have that opportunity in the middle. is not reached with normal sourcing efforts. It is the Talent Engagement Model that facilitates a human touch. engage a more skeptical and the less active prospects. that is lacking in our world of transactions). recruiters seek; and Twitter with its explosive growth, has a high quality (“early adopters” and ”persuaders”) membership that is also attractive as a target audience. the distribution of information to the respective communities. The graphic below illustrates the distributive nature of our approach. solutions we reviewed were a web 1.0 solution in a web 2.0 world. We discovered our vendor partner Jobs2Web about one year ago. I believe we have made each other better. building are the remaining challenge. process that was basically comprised of a series of transactions. about strangers in a foreign land! report on our progress towards meeting this challenge in the future. Engaged talents feel inspired, energized and motivated to give their best and hence talent engagement is central to retaining key talent and securing sustained high levels of individual, team and organizational performance. But the way organizations lead, organize and manage talents frequently results in disengaged, frustrated and demotivated employees whose potential is underutilized and whose performance is sub optimal. Too often the organization adopts a rigid, mechanistic approach to people and organizations, particularly in times of uncertainty and change. 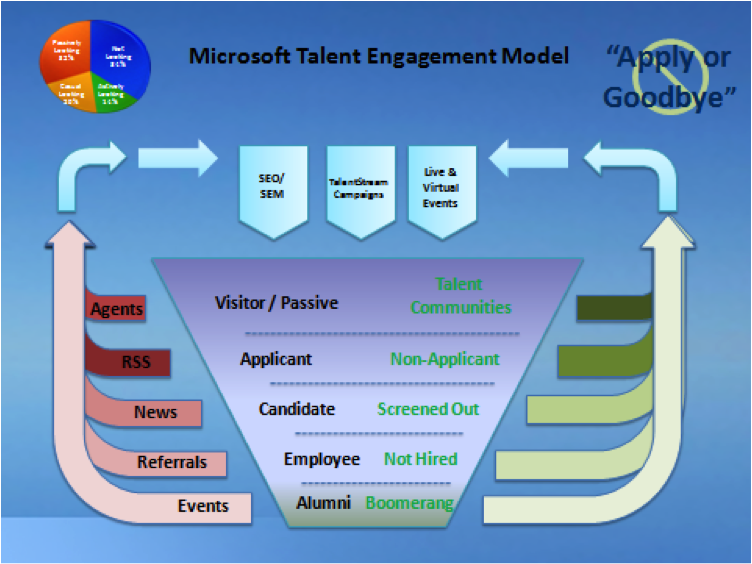 Therefore a Talent Engagement Model is suggested as shown in fig. 4 for the organizations, who really want to engage their talents and want to leverage their skills to accomplish both the organizational and individual goals.The first and the most critical aspect are the, "engagement drivers". These are the levers that organizations can use to build a more engaging work environment. Organizations must hire employees who fit the job requirements, develop leaders with the right skills, and provide support through strong systems and strategies of engagement and convert them into actually engaged talents. Employees expect to be valued and involved, good quality line management, two way communications, career development, clear company values and image and atlast they want efficient and effective use of their skills and talents which help them to convert into an engaged talent Together, working on drivers lead to the formation of an engaging work environment. Once created, the engaging work environment has a positive impact on employee behaviors and attitudes. In particular, an engaging environment builds the feeling of psychological ownership in the minds of talents by meeting their personal and practical needs, thus encouraging them to put redundant efforts for maximum performance and stay with the organization. In addition, an engaging work environment taps into talents' motivation to try harder and put forth the extra effort that differentiates organizations from their competitors. Finally, when organizations have engaged talents, the long-term benefits appear in the bottom line. Organizations have more satisfied and loyal customers, increased profits, better-quality products or services, and greater growth potential. Organizations drive engagement by proactively leveraging three sources of influence for change: employees, leaders, and organizational systems and strategies. These three sources work in unison to build an engaging work environment. Although engagement has multiple drivers, the ultimate ownership of engagement rests within the individual employee. Organizations hoping to drive engagement must tap into employees' passion, commitment, and feeling of ownership with the organization. This is accomplished by implementing the critical engagement drivers as mentioned in the previous section.The engagement drivers initiate more and more engaged talents and tries to develop an emotional connection between the talent and the organization, the first phase of "Cognitive Think". The second important component of the model is generation of the possessive feeling among talents regarding their organization known as "Psychological Ownership", which leads to the positive attitude of "Organizational Commitment" and the positive behavior of "Job Satisfaction" among employees which is the second phase of "Affective Feel". The outcome of the engaged talent can be seen in the "Behavioral Act", the last phase of talents intention to stay and redundant efforts which leads to Talent Retention and Increased Performance respectively. The most appropriate work environment of engagement would lead to a heightened sense of employee motivation, which, in turn, would lead to enhanced or discretionary effort. Enhanced effort is not just putting in the extra time; it also refers to getting things done in the right manner. Talent engagement represents the extent to which the workforce identifies with the company, is committed to it and provides discretionary effort so that it can be successful. Engagement is a key leading indicator for high performance workplaces, improved employee productivity and minimized turnover. please send me these answers . write a note on diagnosing organizations. discuss the value as applied in organizational context. Increased understanding of your own behavior and how it effects others. Structured T-groups have more impact on organizational effectiveness than non-structured ones. Conflict is a process that occurs when a person or group believes that others have or will take action that is at odds with their own goals and interests. hand in hand, even though it may be more comfortable to assume this. organizational diagnosis (15), and the risks of alternative interventions (94). concerned with human processes in organizations (c. Beckhard 20, Fordyce & Wei! and actual responses to the survey will generate motivation for change (136). The part played by organizational superiors in the feedback meetings is critical. meeting with their subordinates in family groups. problem-solving and meeting outputs with an outside consultant present. leads to changes in individual behavior or organizational performance. plz send me answer of this question. 2) write a note on diagnosing organization. Motivation. When thinking about motivation as a behavioral choice process, we most often turn to the Expectancy Theory of motivation. One of the three components of this modle is the the valance, or value, of the expected outcomes of a behavioral choice. An individual's value structure has very strong influence on the valance attached to various outcomes. Decision Making. The decision making process is comprised of three components; Criteria, alternatives, and cause and effect beliefs (theories). The value structure of individuals influences the weight or importance of various criteria used to make decisions. Conflict. Conflict between individuals and groups is a function of either disagreement about theories or interests. The strength of or importance of a party's interests are a function of value structure. Ethics. Values, both private and public, play a central role in determining what behaviors and choices are viewed as ethical or unethical by members of a culture. Socialization. One of the roles of a socialization process in a group or organizations is to communicate its public values to new members. When the socialization process is most effective, the publicly stated values of the group or organization become internalized as private values of the individual. thks a lot for the answers .plz answer to this ques. write a note on constructive feedback. Part of being an effective manager or supervisor is knowing what feedback to give. The trick is learning how to give it constructively so that it has some value. constructive feedback is a tool that is used to build things up, not break things down. It lets the other person know that you are on their side. 1. If you can't think of a constructive purpose for giving feedback, don't give it at all. 2. Focus on description rather than judgement. evaluative language, you reduce the need for the individual to respond defensively. questions about registration procedures, "rather than, "Your communication skills are good." 3. Focus on observation rather than inference. Observations refer to what you can see or hear about an individual's behavior, while inferences refer to the assumptions and interpretations you make from what you see or hear. Focus on what the person did and your reaction. counter," rather than describe what you assume to be the person's motivation, "I suppose you give all forms out that way!" behavior, use adverbs, which describe action, rather than adjectives, which describe qualities. For example: "You talked considerably during the staff meeting, which prevented me from getting to some of the main points," rather than "You talk too much." If you consistently give only positive or negative feedback, people will distrust the feedback and it will become useless. 6. Be aware of feedback overload. Select two or three important points you want to make and offer feedback about those points. If you overload an individual with feedback, she or he may become confused about what needs to be improved or changed. For example: "The number of applicants and the time it takes you to enter them are both within the expected ranges. The number of keying errors you are currently making is higher than expected." Giving feedback constructively benefits everyone. You, as the manager or supervisor, use the on-going exchange of information as a way of getting to know your people and providing them with valuable guidance in their work. The employee, manager, supervisor, or peer receives data that makes that makes her or his job go easier. The organization gains in improved productivity of its workforce. Step 1: State the constructive purpose of your feedback. State your purpose briefly by indicating what you'd like to cover and why it's important. If you are initiating feedback, this focus keeps the other person from having to guess what you want to talk about. If the other person has requested feedback, a focusing statement will make sure that you direct your feedback toward what the person needs. For example: "I have a concern about." "I feel I need to let you know." "I want to discuss." "I have some thoughts about." Step 2: Describe specifically what you have observed. Have a certain event or action in mind and be able to say when and where it happened, who was involved, and what the results were. Stick to what you personally observed and don't try to speak for others. Avoid talking vaguely about what the person "always" or "usually" does. For example: "Yesterday afternoon, when you were speaking with Mrs. Sanchez, I noticed that you kept raising your voice." Step 3: Describe your reactions. consequences of the observed behaviors, the other person can better appreciate the impact their actions are having on others and on the organization or team as a whole. For example: "The staff member looked embarrassed and I felt uncomfortable about seeing the episode." "Shouting at our students is not acceptable behavior in this department." Step 4: Give the other person an opportunity to respond. Remain silent and meet the other persons eye, indicating that you are waiting for answer. If the person hesitates to respond, ask an open ended question. For example: "What do you think?" "What is your view of this situation?" "What are your reaction to this?" "Tell me, what are your thoughts?" Step 5: Offer specific suggestions. Whenever possible make your suggestions helpful by including practical, feasible examples. Offering suggestions shows that you have thought past your evaluations and moved to how toimprove the situation. Even if people are working up to expected standards, they often benefit from ideas that could help them to perform better. If your feedback was offered supportively or neutrally, in the "for your information" mode, or depending on the situation's circumstances, suggestions may not be appropriate. Use your common sense and offer an idea if you think the other person will find it useful. Don't drum up a suggestion for improvement just for the sake of it. "Jennifer, I sometimes write myself notes or put up signs to remind myself to dosomething." asking him specific questions about the information you are most interested in." Review the major points you discussed. Summarize the Action items, not the negative points of the other person's behavior. If you have given neutral feedback, emphasize the main points you have wanted to convey. For corrective feedback, stress the main things you've discussed that the person could do differently. End on a positive note by communicating confidence in the person's ability to improve the situation. For example: "As I said, the way the group has figured out how to cover phone calls has really lessened the number of phone messages to be returned. You've really followed through on a tough problem. Please keep taking the initiate on problems like that. person—a way to conclude even an negative feedback situation on a positive note. come straight to me if the schedule is a problem. plz plz send me this answers of this question below. 1) Explain how the strategy of an organisation influences its employee policies? 2)Define Employee Engagement. What are the different factors that influence employee engagement? Qn 2) Define Employee Engagement. What are the different factors that influence employee engagement? express themselves physically, cognitively, and emotionally during role performances. individuals are in Flow State little conscious control is necessary for their actions. them in this way their people invest in them. talented employees and providing opportunities for personal development. regardless of their job level. innovate to move the organization forward. with high levels of customer engagement. also be provided with certain benefits and compensations. and systems for the health and safety of their employees. heard by his boss than the engagement levels are likely to be high. well as the supervisors co-ordinate well than the employees will be engaged. plz send me these answers. change to guarantee organizational survival. for addressing the important problems, it has the threat of unsystematic rationality. the decision making process led to legislation to provide more structure and control. pl z send me these answers of the question below plz. Sanjay is a trade union leader with twenty years of experience in an industrial organisation. One of the laborer’s in the organisation met with an accident while on duty. What will be the different means by which he will ensure that the laborer is well compensated for the work-related injury? Use the following books to get your answer for injury compensation to laborers' in Trade Union. 1. Explain section 138 of negotiable instrument act. What changes it has brought in the business environment? In your option what needs to be done to make section more effective. 2. How will you assess the performance of RBI in the light of global melt down? What proactive measures taken by RBI blunted the impact of melt down on Indian Banking System. plz send me these answers plzz. 1)Elucidate the importance of employee reward and also explain the various types of employee rewards. 2)Explain what is Employee empowerment? What are the effects of employee empowerment? 3) Describe the disciplinary procedure commonly followed in Organizations. Section 138 of the Negotiable Instruments Act states that the return of a cheque by a banker because the money standing to the credit of the accountholder is insufficient to honour the cheque or that it exceeds the amount arranged to be paid from the account by an agreement made with the bank, is a criminal offence. The drawer shall be deemed to have committed an offence and such offence will be punishable with imprisonment for a term up to two years imprisonment or with a fine twice the amount of the cheque or both. (a) The cheque in question has been issued in discharge of a liability only. Unless contrary is proved, as per the provisions of section 139, a cheque is presumed to have been received by the holder in discharge of a debt or liability. A cheque given as gift will not fall in this category. (b) The cheque is presented to the bank for payment within six months or its specific validity period, whichever is earlier. (c) The payee or holder in due course has given notice demanding payment within thirty days of the receiving information of dishonour which should be for a reason other than insufficiency of funds. (d) The drawer does not make payment within 15 days of the receipt of the notice. The complaint can be made only by the payee/holder in due course, within one month. If the person committing an offence under section 138 is a company, every person who was in charge of the affairs of the company and was responsible for the business of the company at the time offence was committed shall be deemed to be guilty of the offence and shall be liable to be proceeded against and punished accordingly. (Section 139) However, a person shall not be punishable under section 139 if it is proved that the offence has been committed without his knowledge or consent and that he had taken all due care to prevent commission of the offence. · The cheque has been presented to the bank within a year from the date on which it was drawn or within its validity. · The payee or holder makes a demand for paymenmt by giving notice in writing to the drawer within thirty days of the receipt of the information. · The drawer of the cheque fails to make payment within fifteen days of receipt of the notice.